As you know when an engine reaches high mileage, components are not what they were when they were fresh and young. Though the deciding factor is the care that the owner takes to maintain youth reliability of components. Regular servicing and oil changes are a must, also the use of good quality oil, not the cheap reconditioned oil. If you imagine at start up a thicker oil would take some time to pressurise the tappets, as the oil feed hole is very small, so a thinner oil would flow into this more quickly. 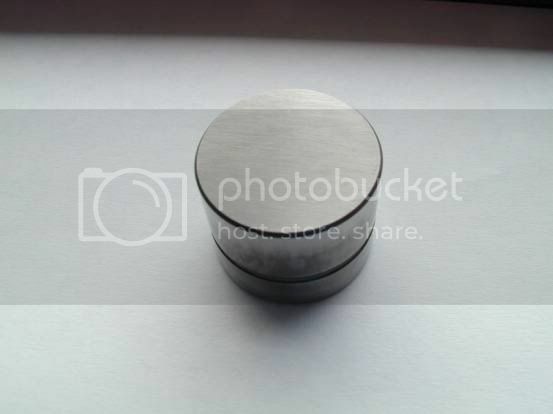 Another factor for rattles on tappets is the oil feed hole may become blocked, with sludge, subsequently the inside where the piston valve run would also suffer from this and possible varnish build up. 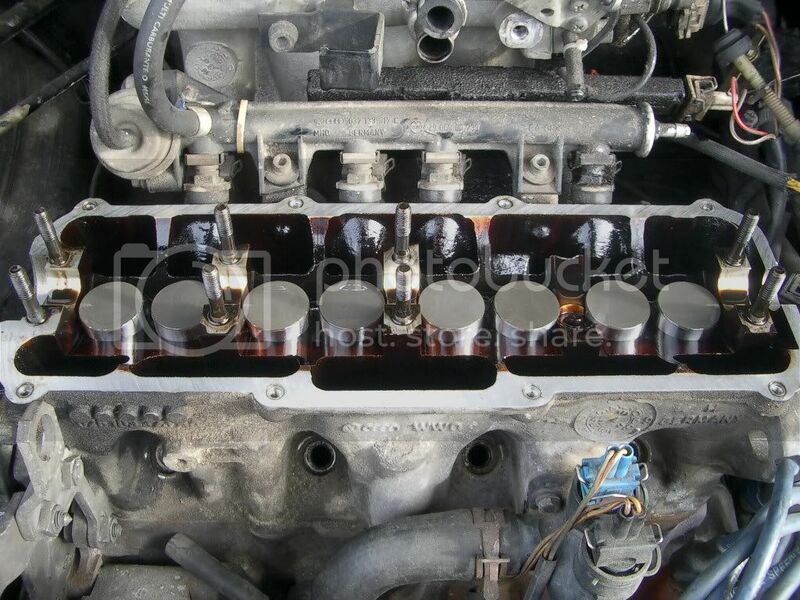 Now with hydraulic tappets, it is generally best to use an oil that flows well, not necessarily Mobil 0W40, but a range from about 0W – 10W should be fine. I personally have found 5W40 a good compromise. Engine flush may help, but if they are really blocked, or infact the spring inside the lifter is broken, there is no way you will know other than taking them out and cleaning and testing each lifter. Below I will go through the steps required to clean and test the Hydraulic Lifters, in most cases they are just gummed up. I have just taken out the lifters out of my car as I'm doing a top end rebuild, I initially though about replacing them before I learnt that they could be cleaned up and tested in their functionality. 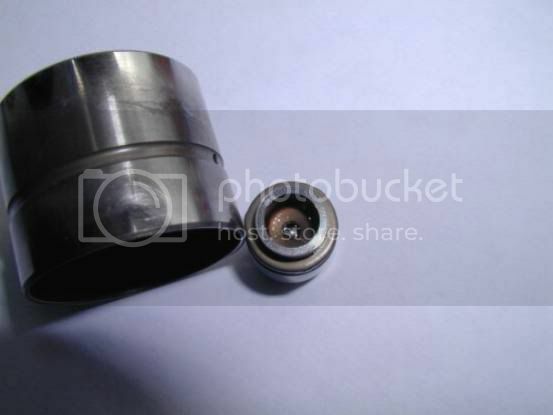 The picture below shows the piston inside the tappet. Once the lifters have been taken out of the head (making sure you have numbered them to its original locations) give them a wipe, so to clean off any excess oil. Once this is done, find a wooden surface, not your kitchen table, as it will get quite messy, but an old MDF board or similar. Hold the lifter with the open end facing downwards and tap quite hard several times, and see if the piston has moved downwards? If it has the if will come off fairly easy with either further tapping or with assistance of a pair of mole grips. This next step would be time consuming, but this is how I did mine as they were badly gummed up. In which case the best thing to do is soak them up in a bath of Gunk engine cleaner or Jizer overnight. 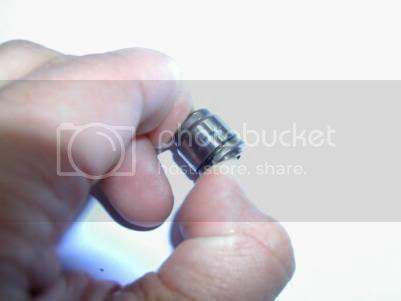 But as you soak them in, with a pair of pliers try to free up the piston in all 16 lifters so it goes up and down in a smooth manner as this would free it if it had become gummed up. What you will find in the morning is most of the oil would have flowed out of the lifter, simply take them out and flush them with fresh cleaner and a cloth. Now, what you will need to do if get a old pot or something and as you pull the piston up and down a lot of oil and gunk will shoot out of the hole in the lifter keep doing so until no more fluid comes out. After this try to tap the pistons out, by knocking them on a hard wooden surface. Again, full clean out the inside of the tappet, getting rid of any oil deposits, gum varnish etc , this is done by using a small brush/ cotton buds with some gunk poured into it. This picture shows the piston that is fitted inside the lifter, look to the centre, and you will see a ball bearing, this acts as a release valve to let oil in and out of the piston. Now that we have established this, you can get a pointed object, like a small punch or similar and depress the ball, what you will get is the oil will begin to come out, keep doing this until all the oil has come out. Having done this what you need to do now is to test to see if the spring inside is ok, or whether its collapsed or broken, this is done by compressing the piston. If all is ok, just clean up the piston, making sure the sides are totally clean with no varnish or gum. We will now go onto see how we can sort out the tappet itself, i.e. 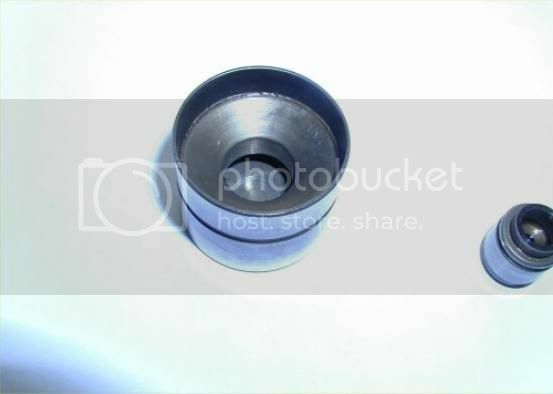 the bucket shaped part where the camshaft lobe pushes against. Normally after several thousand miles, you will no doubt have some wear. 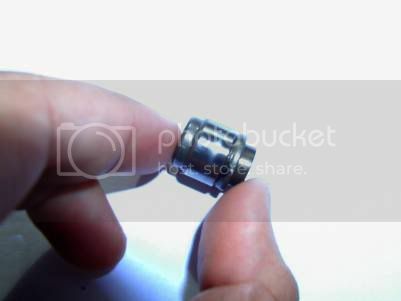 You will now need to linish the tops of each tappet, this can be done by using P240 wet/dry paper using WD40 as a lubricant, put the paper on a flat surface (a machined pieces of steel or a small sheet of glass) and then rub the base of the follower is a circular motion over the paper, make sure you turn the follower regularly as you linish, keep going until there are no scuff makers present. If you have some wear on the sides of the tappet, then very carefully and lightly smoothen up with some 1200 or 2000 grade wet and dry paper, but don't over do it as this need s to be a tight fit inside the cylinder head valve bores. Finally once all the lifter have been cleaned assemble the lifters and put them in a bath of *hot* oil, the hot oil will cause any air inside to expand and be forced out, mind you don't burn your self.. put the lifters open side down. Then allow the oil to completely cool, the remaining air will contract and be replaced by oil.. that will get them nearly full, test each of the little ball valves before you put them back together. Start by switching to fully synth oil with VW oil filter. Also do an oil flush before switching to synth. In my case it helped A LOT! so how good is synthetic anyways??? synthetic oil?? really?? 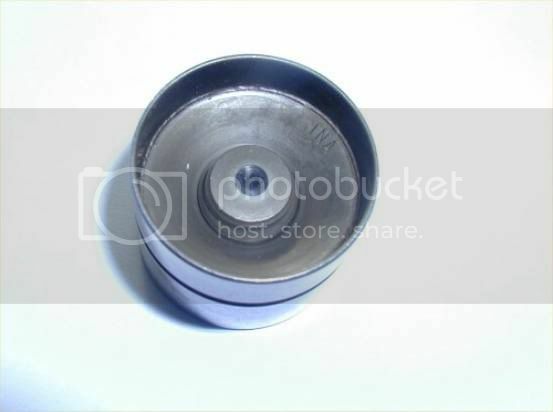 i thought that was only for like, new cars..
How hard did you have to whack the lifter to get the piston to pop out? I ask because my batch of lifters soaked for 2 days in Gunk, the pistons move up and down fine and they spin 360 without a snag, theres no more oily goo coming out of the the little hole on the side of the lifter when i flushed it but the pistons are still stuck. After renovating my engine i got that tick, tick sound and then going to klack klack klack sound. I took every lifter loose and all was dissambley them and the last(of course) was loos from the beginning,, the litle ball inside the cylinder doesnt hold back the oil. Have I localized the problem with that lifter then? Yes, if the tapet has loose the center part then it's probably the reason you hear it. Broken spring probably. Oh didnt even realized that was the case, 10years. Thanks for the update, but after cleaning cleaning and pinching the ball i got it starting to working. Now it holds pressure and works as the other maybe gunk or some dirt that have cleant away.. I will test if it works. Yeah, it has been a while. I still have black_cabbie's headlamps that he sold me [still in the box too]. Hi Great write up! But cant see the photos. Im new to the website is there something I have to do to be able to view the photos? A simple photobucket fix is all you need. The pictures work for me.